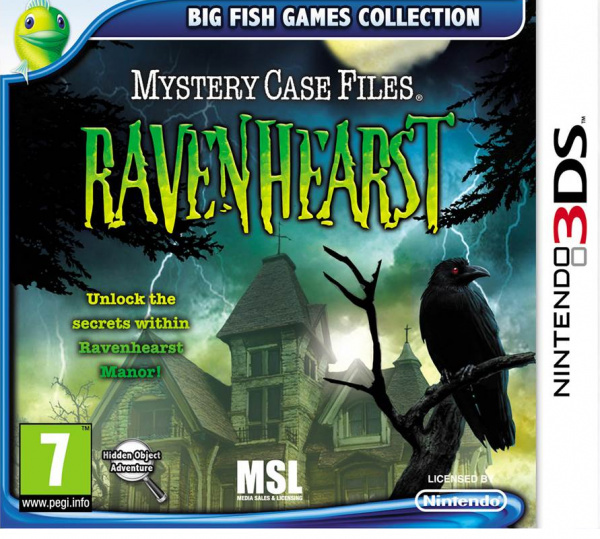 The standard Nintendo DS version of Big Fish Games’ Mystery Case Files: Ravenhearst was released on 19th April 2013. The original game that DS title was based on was first published for PC systems in February of 2009. So to find that this “new” 3D edition of a four-month-old DS port of a four-year-old game is being pushed is a bit of a mystery case in itself. With that in mind, the best thing to do first of all is to ring the changes between this and the standard DS version. Apart from the fact that the top screen provides a 3D effect (as you’d expect) – there are none really to speak of. A few screens are arranged differently, but the box art is the same, the title screens are the same, and the gameplay is the same. So, if you’ve already played this one through on DS, you can scratch the 3DS edition off your list. Without giving any of the story away, Ravenhearst Manor is the setting, and as a detective it’s your job to get to the bottom of a troubling case. To do this, you must piece together the details by unlocking the diary entries of Miss Emma Ravenhearst. 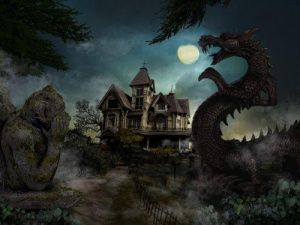 Diary entries are unlocked by successfully completing jigsaw puzzles, which are made available by finding the required number of items throughout the manor’s various rooms within a set time limit. Each room is portrayed by a single image that contains hundreds of items that are splashed about all over the place. You’ll spend most of your time with the game in these rooms, scrolling around, trying to hunt down that final item from a list of entirely unrelated bits and pieces. The unfortunate truth of it all though is that a lot of the time, you may have trouble finding one or two items, but there’s a good chance that it isn’t your fault. In one area where you’re asked to find a clothes pin for example, we searched for a good 20 minutes, eventually giving up and using one of the limited supply of assists to find it for us. We couldn’t find it because it was beige in colour, and was placed in front of something else that was all but identically coloured. Essentially, we were looking for the 10-pixel high dark line that made up the gap in the pin, as that’s all that was visible. Items appear in the most ridiculous of places, too. A machine gun can be found in the right angle between the ceiling and the wall, apparently held up by nothing. A pair of shears might just be hanging in the sky. 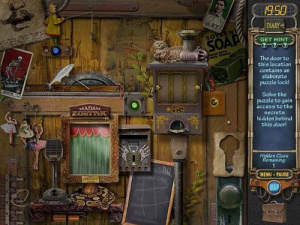 There’s very little logic to any of the “hidden object” parts of this hidden object game and that does nothing but cause confusion. In some cases, the limited resolution of the images can cause you to miss things that you’re looking for, too. Only two levels of zoom are available (“zoomed” and “not zoomed”), so you’ll have your face about an inch from the screen for a lot of your playing time — and even when that’s the case, some items are barely recognisable for what they apparently are. In one room you need to find a fortune cookie and an orange slice (among other things) and selecting something that looks for all the world as if it is indeed that evasive orange slice ends up giving you a check mark against “fortune cookie”. Best keep on looking. Mystery Case Files: Ravenhearst does try to do a couple of things a little differently though, and it’s to the developer’s credit that it's even tried to mix things up where a less scrupulous team wouldn’t have bothered. 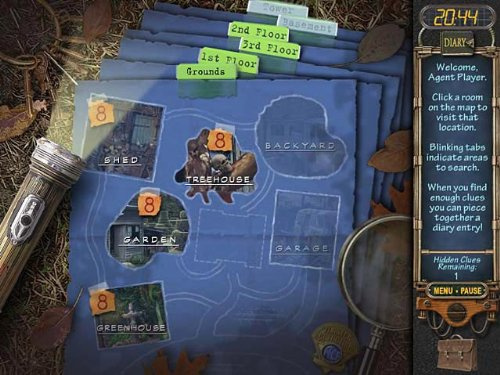 Puzzles prevent access to certain rooms and – given the complete lack of information about the task that you’re facing – they can be taxing indeed. A couple of Rube Goldberg machine-based puzzles in particular are next to nonsensical, until you start randomly tapping things on the screen in order to get something to happen somewhere. Hit that key button or switch, and generally one thing will happen that causes the rest of the puzzle to click into place in your brain. As we say, credit must be given for trying to add something new, but something must also be detracted for the haphazard and rushed way that these puzzles have been thrown into play. If you have to ask yourself if you should activate a fortune teller machine first, or whether beating a ghost at Tic-Tac-Toe needs to be done before that can happen – bearing in mind that you have next to no instructions - you soon realise that the puzzles here have been rushed together. You’re more likely to beat them by tapping randomly than using your noggin. If you’re looking for further examples of this, just check out the other types of puzzles – jigsaws - that you need to put together in order to complete a level. A distinct lack of forethought sees you putting sepia-toned puzzle pieces into place over a slightly lighter sepia-toned outline of the drawing that you’re trying to recreate. Our relatively young eyes could just about see the difference in the shades but had to throw in a few double takes at times, so more mature gamers, or those without 20/20 vision will undoubtedly have trouble here and there. We’ve also experienced a couple of issues where we’ve found all eight items in a location, backed out to the menu in order to move to the next location, and been told that we’ve still got three items left to find back in the room we were in. Heading back into the room shows your completed item list and nothing else. For all intents and purposes, three items have been counted on one screen, but haven’t been on another. This has the unfortunate consequence of making it impossible to get enough items to unlock the next diary entry, so you have no option other than to let the timer run down and start again. Poor fare, indeed. 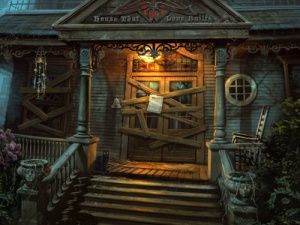 Unless you’re a fan of hidden object games, there’s little to be found at Ravenhearst Manor that will draw you in to the genre. 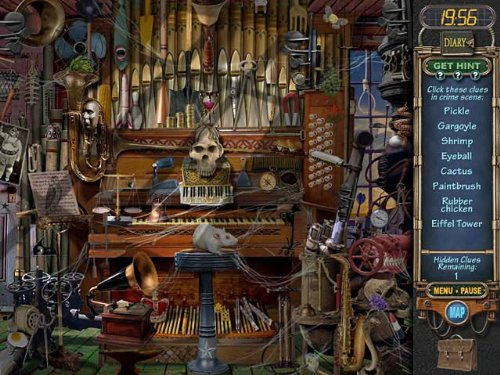 Being brutally honest, even if you are a fan of this type of game, this entry in the Mystery Case Files series contains more than its fair share of issues and well-intentioned, yet poorly thought out sections to push it to the top of the genre’s tree. On occasion, the tension of beating the clock to find that last item is enough to convince you that you’re having a whale of a time, but it’s rare. Gosh darnit. 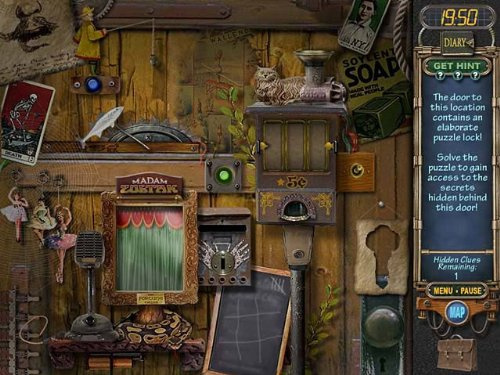 I'm always interested in these mystery kinds of games, but I don't care for the hidden object mechanic, especially when it's just an arbitrary mess. I need something like some of the better Nancy Drew games with a variety of fun puzzles. I enjoyed the Wii game (The Malgrave Incident I think it was). I really liked the atmosphere of the scenes you could move around in. Are there similar scenes in this one? Also, is the 3DS' wider top screen taken advantage of, or does it have black borders on the sides? Honestly, I could really become interested in a game like this. It's just too bad that this game doesn't have enough polish to encourage me to consider buying it. Loved MCF on the Wii. It was one of only a few games my wife played with me. Worth getting. Sounds like the DS game is a miss though. Sounds like i should stick with "where's wally??" I love BFG, but their games are best played on a PC-- or a tablet, if it's ported right. Beautiful artwork, music, and stories, many of these games are so captivating and are big time suckers. Would you recommend this or 'Jack The Ripper' on the 3DS eShop? @WinterWarm Hi WinterWarm - thanks for your kind comment! I can't say that I've played Jack The Ripper on the 3DS eShop as yet. It wouldn't have to be too special to be better than MCF: Ravenhearst, though! Ah, gotcha. Alrighty, then. I'll just take a plunge. Thanks! Is this coming to NA? I would recommend getting them on PC (STEAM?) or playing the games in a Tablet. I love the chapters of Ravenhearts in Mystery Case Files, there are 3 Ravenhearts games so far (a fourth in development I hear) the best one in my opinion is Ravenhearts 2 : Return to Ravenhearts, either way the atmosphere in the Ravensheart saga is absolutely fantastic (despite some gameplay issues). I love the beautiful intricate collages of old stuff this series (and the genre as a whole) often produces, but I'm not a fan of the gameplay mechanics as such. Wow that game is ugly. YUCK. Could you one day also review some more 3DS games from Big Fish Games? I'm interested in some of their other adventures (Return to Ravenhearst, Azara, Secret Mysteries in London) and I'm wondering how well they hold up against the PC versions and if they are worth buying. Late to the comments here but IMO what kills this game for me is the timer. OK, I'm a heck of a lot older than most folks on here so my eyes are not the sharpest. Trying to find the hidden objects was tough but since Im an avid HO gamer that is no big deal. I play games to relax. The worst aspect of the game is trying to assemble the VERY sepia toned parchment pieces that also have to be turned in the right direction with the stylus. Maybe on a PC screen it's not too tough but on my 3ds XL all the pieces look alike. It is so difficult to see that I even removed my contact lenses and put my face really close to the screen. And you know what? I would eventually be able to assemble that puzzle AND enjoy doing it if that no good timer wasn't ticking away. When time runs out ALL progress is lost and you have to start that level all over again. Fortunately I bought it on sale in the eshop so I'm only out $4.00 but if I knew that there was no way to play without the timed aspect I wouldn't have bothered. I know I wont download Return To Ravenhearst even though it's on sale too.